I do visit every link. Sometimes it just takes me a little while! But I will be by, scouts honor! The McLinkey will be live from 1:00 pm MST time Wednesday afternoon in an effort to assist our lovely "friends across the pond" and continue through 10:00 am MST time Saturday morning! Please share your fanciful F post now! 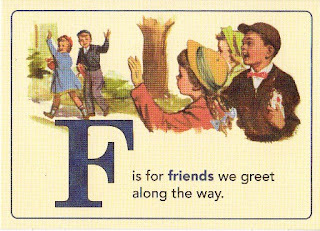 F for friends is my choice, as the quote goes, friends are the flowers in our gardens of life. Merry Christmas to you. Family can be your friend too!